We have lots of threads on swords, daggers, shields, kits/harnesses and other weapons, but so far nothing dedicated to bows and crossbows. So let's see what you've got. 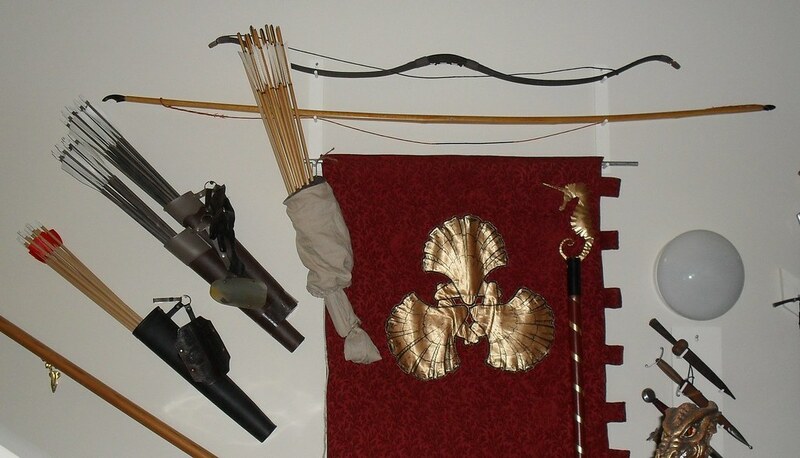 Besides including bows and crossbows, photographs of arrows, bolts, and quivers are welcome too. I would prefer to see reproductions of old crossbows and bows, rather than modern ones. I do not have any bows or crossbows at the moment, but I am sure more than a few of our members do. I shoot (not nearly as much as I would like) a 40# Crimean-Tartar bow. It is a biocomposite laminated bow build by Csaba Grozer (http://www.grozerarchery.com/). I own another bow (olympic recurve) as well, but I can't even remember the last time I shot it. It is a really nice bow to shoot, although quite unforgiving to sloppy releases. I cannot compare it with the feel of a true horn bow, because I don't own one and as such haven't shot enough with them, from what I tried, the feel is very close to a real horn bow. A shooter who does own and shoot a true horn bow came to more or less the same conclusion and thought that the difference between different horn bows may be as large or maybe larger as the difference between his bow and mine. Nice shot of the biocomposite layer (compressed horn) and the small siyah. (the string is a modern one). Unstrung you can see it quite c-shaped, but not as extreme as some Turkish flight bows. (note: the images are the images of my bow when it was for sale). Late 15th century crossbow. Draw weight about 450# depending on string tension. Bolt velocity is crazy, I can't see the trajectory at all. 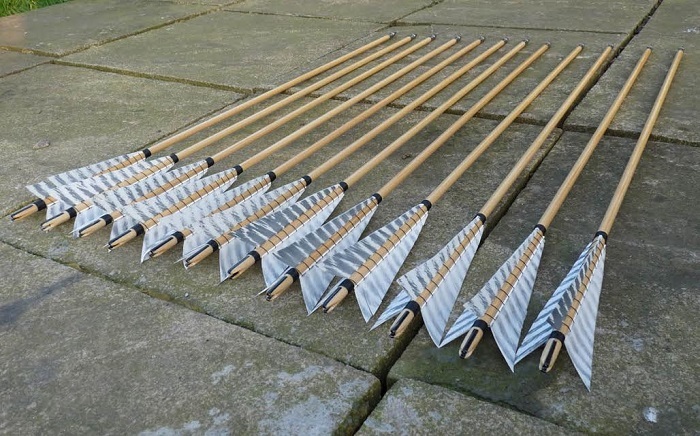 Got a dozen 5/16" pine target arrows with field points as well. Tjarand that looks like a really nice crossbow. I wonder if you are able to tell me some more about it like: range, rate of fire, preferred shooting position. Oh by the way do you have a way to attach the goat foot lever to your belt? Could you possible lose it in a fight/battle or is it not much of an issue at all? I'd also be interested to know who made it! I've been wanting a crossbow like Tjarand's for a while now. Nice composite and long bows, too! I will second Jasper with Grozer bows, they are a wonder to shoot ! Here is an "in action" photo of my bow and me. It is also from Grozer Csaba, it is the Hungarian Base (at the time I was a student and didn't have a lot to spend in a new bow) but despite its modern composite construction this bow has served me well both in re-enactment and in club shooting . Seven years later, it still do its job every week at the target range ! It is a 60#@28", strong and fast. I have had several other bow before this one, but it is by far my favorite ! I like the photo, Leo! The grass juxtaposed with you and your kit is a nice effect. Thanks for the kind words ! The grass effect is sort of a mistake that turned out good, the photo was taken by a friend, who is no photographer at all. He used an autofocus which focused on the grass rather than the background, that's why the photo is a bit blurry, but you are right, it still looks cool ! That's good timing! I just got a load of my bows and arrows that I've made photographed by a history magazine, so have some high-res shots of them. These are from my Facebook so the quality will be slightly lower, however. I don't have a lot of details about the crossbow maker actually. The bow and irons are Tods Stuff and the stock and trigger mechanism made by a Italian bowyer but I never found out who. The craftmanship is very solid though. The stock is ash, very high density and a beast to lug around even though it's quite compact. I have never tested the rate of fire, but with some practice it would not be too bad. I have tried a few firing positions and feel that rifle style gives the best aim. But I can also shoot from the hip and hit the target, kinda like shooting a bow without aiming, just looking at the target. The goats foot has a clip like you would see on a buckler. It hangs in the belt quite securely due to it's weight. A short video of spanning and releasing 2 bolts here. Note that I really have to lean in to pull the string down. Tjarand's crossbow (that was mine before selling it to him). 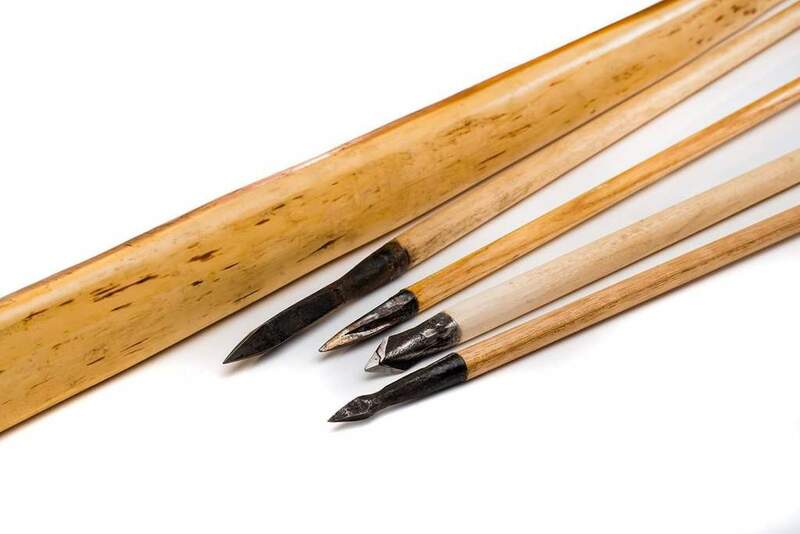 the maker's name is Alessio Cenni and he lives in Florence, he's not a professional but very skilled and talented, he has written a lot of arcticles for the Society of archers antiquaries including one where we have measured 3 crimean tatar bows that are currently located in the Bargello Museum in Florence. 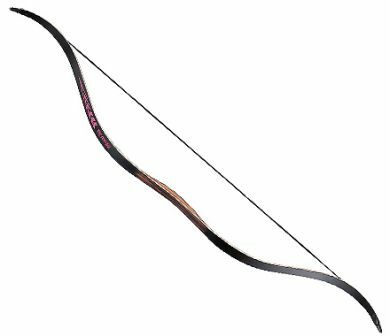 I've got a cheap (£65) 65lb bow that I bought on eBay. Despite the (very) low price, it shoots beautifully and is probably one of the best purchases I've ever made. 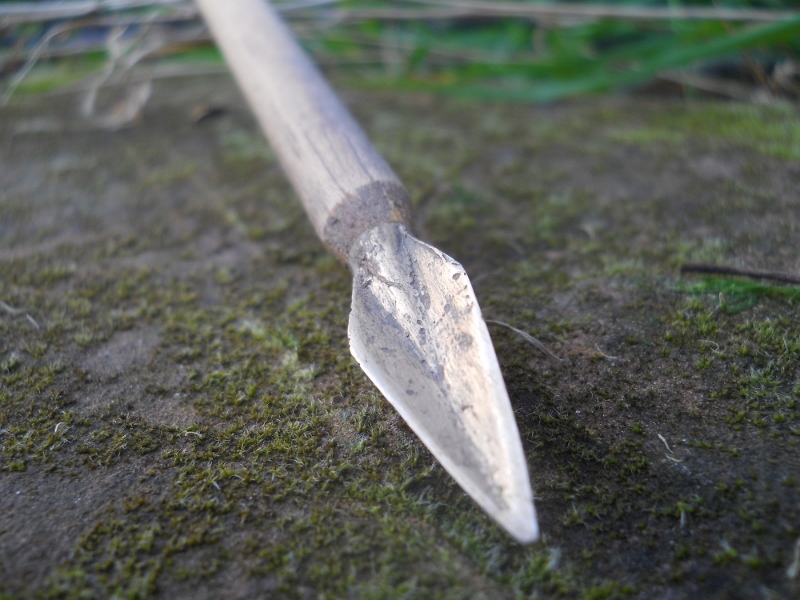 I've also got a couple of bronze trilobal arrowheads made by Neil Burridge. 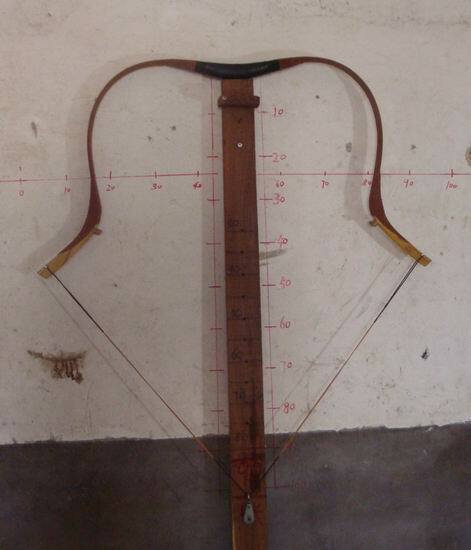 I'm going to make a crossbow in the early Gothic style at some point, just need to get the prod I said I'd buy. Very nice everyone, in particular it is nice to see Kristian's Burgundian style bow, very common in art yet this is the first reproduction I've seen. 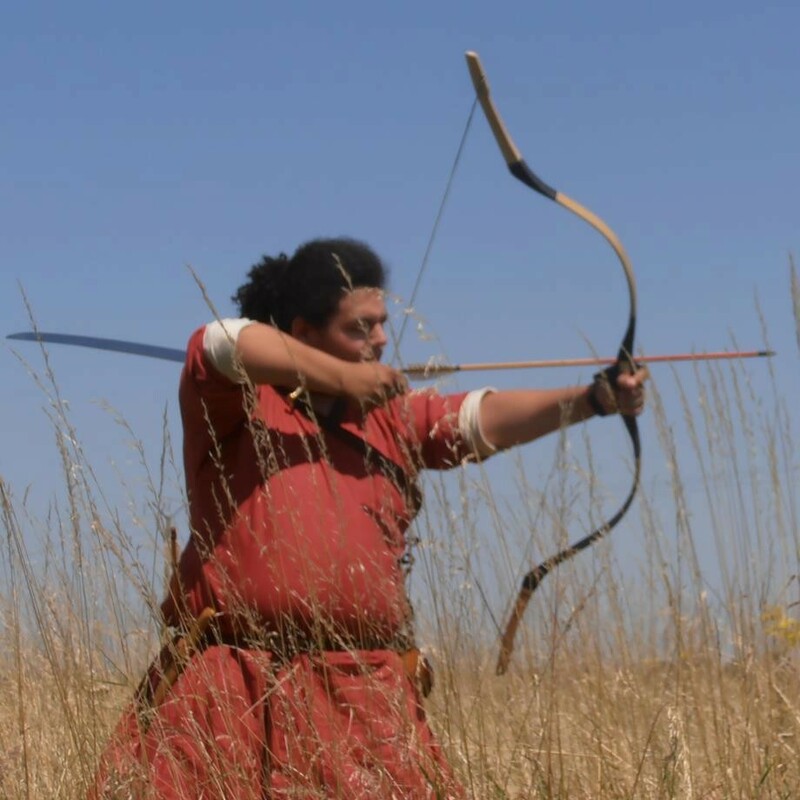 Don't have any photos of my historically-accurate bows (bamboo yumi, Papuan longbows). Here are the two I shoot most often. 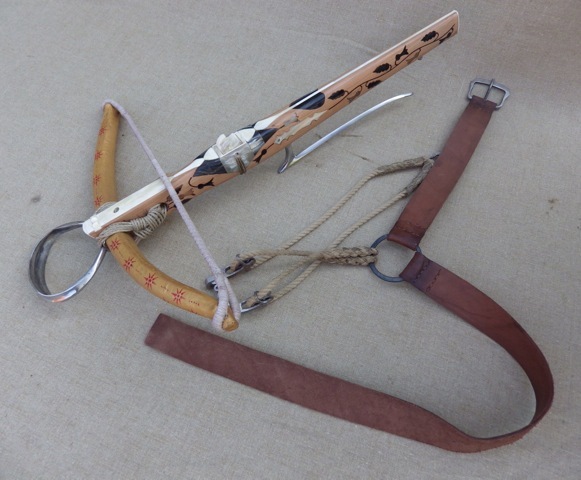 A cheap Chinese-made Chinese/Manchu/Mongol style bow. As the picture shows, it can manage a 100cm draw, which is useful for thumb draw (don't need 100cm, but close to 90cm is good). Mine is supposed to be 45lb at 28". Haven't measured the force-draw curve. Easy, friendly, doesn't stack too much to at least 90cm. This is perhaps my best bow, a Samick Mind 50, 45lb at 30". I don't shoot it as much as the one above (I'm willing to leave the one above strung, but not this one, so it's not as immediately available). It's much faster than the above bow. Also long-draw, good for thumb draw. Working recurve as opposed to the static recurve above. 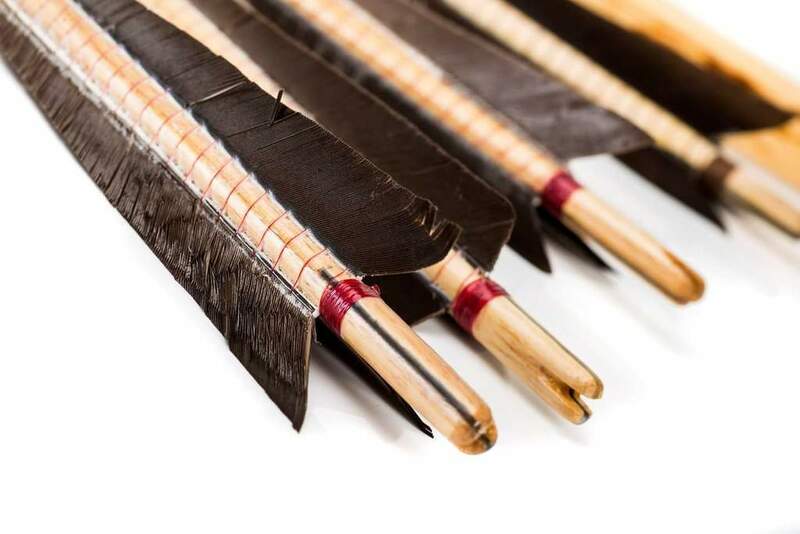 Deviations from historical are very little reflex, working recurve rather than short stiff siyahs, and materials (carbon fibre-wood laminate). A traditional Korean bow would be much stiffer early in the draw (much more reflex), probably stack less, and be faster. 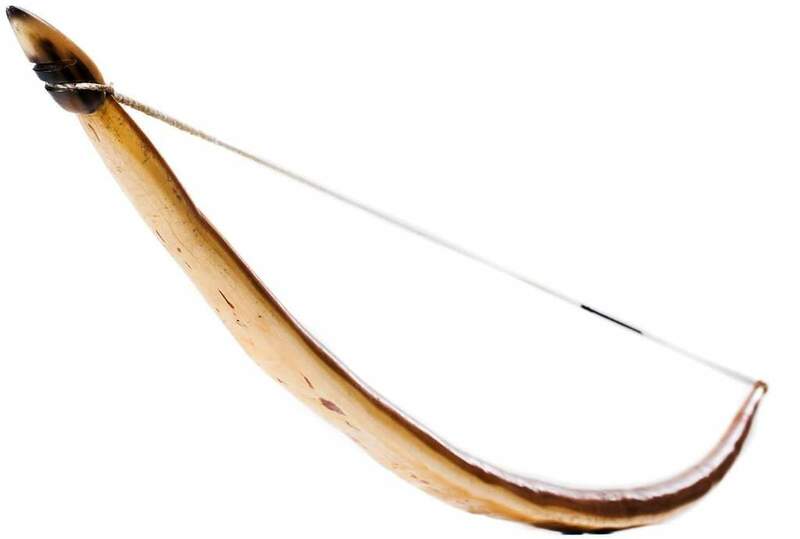 Made by Tod's Stuff, 400# steel bow dressed to look like a composite, based on a hunting crossbow of about 1450, currently in the Royal Netherlands Army Museum. 74" (50# draw wt) ELB. And a sythian recurve 30#. The arrowbag has tapered ash shafts for the ELB. 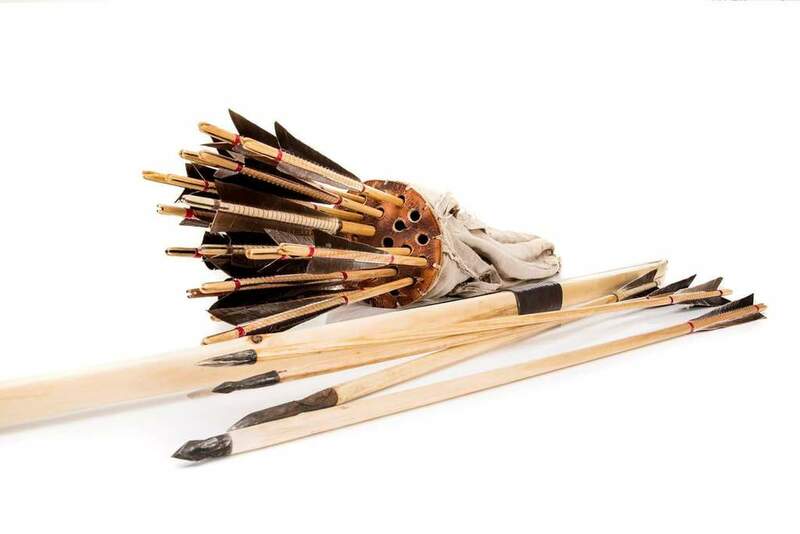 The hip quivers are cedar shafts for the ELB and the scythian. (The small 2" fletches are for the 30#. It doesn't need the fast stabilization and I think benefits from the lower drag at the low 30# weight). I have a few bows, but two are of interest here I think, but unfortunately I am away from them for a few weeks but will try and post up pictures on my return. The most recent buy is a 95lb Italian yew EWB that originally was made by Celestino and then was retillered by Joe Gibbs. It is a beauty and I love it. 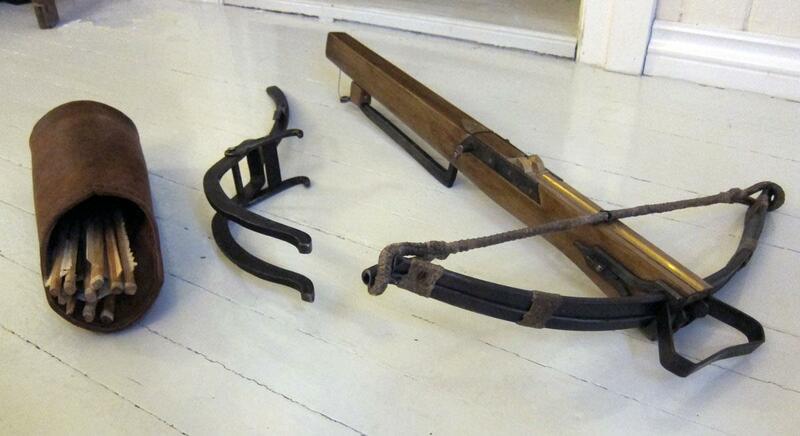 The other is made by Chris Boyton and he described it as an Italian bow. It is a classic recurved short cupid bow style made in laminated yew. I saw him making it, fell in love and ordered one there and then. 55lb but fast as hell.